We headed back to town and by this time I had checked FaceBook at the local internet cafe in the launderette — and learned that my world of work had been turned upside down – but didn’t know quite what had happened. I wouldn’t recommend that you be across the world when things like this take place. So off and on for the rest of the night, I ran down the street and stuck my coin in the computer for a few minutes of online time – but no news. Again – I wouldn’t recommend this method of getting (or not getting) important news. 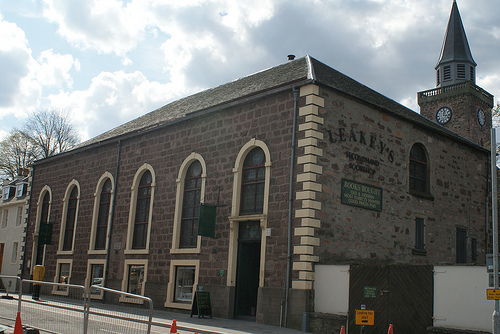 FG, DG and I headed downtown to Leakey’s Cafe and Bookshop which was located in an old Gaelic church. This place was huge with thousands of books. First we had a cup of tea and then we looked around. But to be honest, it was all rather frustrating because I knew I couldn’t fit books in my already-cramped suitcase, so I wasn’t that interested in finding anything – because I didn’t want to find anything I really wanted, but couldn’t buy. But I would like to be back there with an empty suitcase because so many of the books were books you wouldn’t be able to get here. Besides, I wanted to check the internet again – so I left the two others at the store and once again headed to the launderette – still no news. By this time FG and DG were back, so we met up with RM and went off looking for a place to eat. The recommended Early Bird Special restaurants were already full – so we ended up at Riva, an Italian restaurant – and ate outside, overlooking the River Ness, across from the Inverness Castle. Relaxing and unique location. One of the cool things about this restaurant was the ladies room mirror! When we finally got our check, we wandered off down the path next to the river. Soccer game at the park. Our hotel from across the river and the street. The view from where we were eating. A church along the river.